The traditions of Pyromancy in the Great Swamp is relatively new, as Salaman became Quelana's pupil only roughly 200 years ago. Upon returning home, he was quickly called Master Pyromancer and got the nickname Great Fireball, possibly for the spell he used or created. He took pupils, Carmina being the most accomplished one. The name 'Salaman' could be made parting from the Salamander, which is one of the multiple mythological beings of fire. in the story of pyromancy rather than in the story of Dark Souls. but only his name appeared in the original story. His visual image has actually been created and he is one of my favourite characters. Pyromancer's combat relies on a clear offensive strategy, casting pyromancies and dealing heavy blows with the hand axe. The robes worn by this class, though seeming tattered, are indeed very resistant against harsh environments and elemental damage. This is due to the nature of the Great Swamp, where adaptability is key to survive. 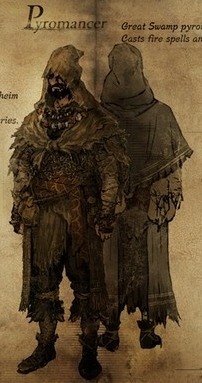 The lifeless body of a pyromancer is found in Blighttown, along with the poison mist spell, an unique spell created by Eingyi. It could possible that Eingyi was the one who poisoned the swamp in Blighttown. Pyromancy is the art of casting fire. Produce flame, the channel it; just as our ancestors did. A pyromancer must be in tune with nature herself. My home, the Great Swamp, is an abundant store of nature. You will understand, one day; it only takes time. Pyromancy has a, well, rather primitive aspect to it. It meshes poorly with advanced culture, and pyromancers are considered rather unsavoury. In this land, pyromancers earn a certain respect. The Witch of Izalith, one of the legendary Lords, is the godmother of pyromancy. My teacher, whom I imagine still resides in the Great Swamp, had a funny way of putting it. He said that "Pyromancy is the ultimate fantasy…"
"We are born into Dark, and warmed by Fire, but this Fire we cannot touch." "Those whose fascination with Fire persists, learn to hold it in their own hand." He rather had a way with words, the old withering frog! Worn by pyromancers of the Great Swamp. Though it appears tattered, it is actually quite strong. Their attire offers substantial protection against poison, fire, and other forces of nature out in the hinterlands where they were driven. Unique pyromancy crafted by Eingyi, considered a heretic even at the Great Swamp.